An article published last week in The Economist proclaims, "the mystery of the pause in global warming may have been solved. The answer seems to lie at the bottom of the sea." No, sadly, the mystery of the "pause" and Trenberth's "missing heat" have not been solved, nor the question whether the "missing heat" ever existed in the first place. The article claims "People with a grasp of the law of conservation of energy are, however, sceptical in their turn of these positions and doubt that the pause is such good news," which is a false assumption because the only 'evidence' that there is any "missing heat" is the falsified output of climate models, which cannot provide 'data' or evidence. Further, the article goes on to make astonishingly erroneous statements that violate physics/thermodynamics, including claims that man-made CO2 heat sinks to the bottom of the ocean and once the ocean depths become "hotter than the surface...global warming will resume." Thus, The Economist has become a denier of convection. 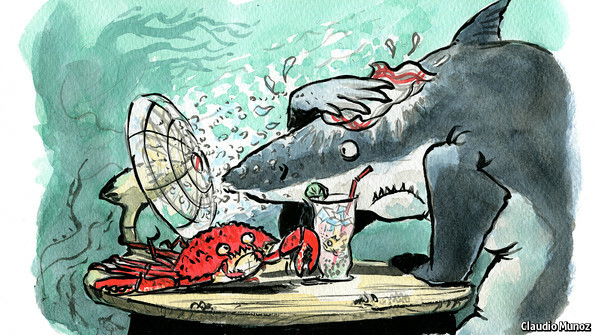 4) trying to make ocean warming sound scary by using Joules instead of degrees. The oceans have warmed only 0.09C over the past 55 years, and thus the most that ocean warming could re-heat the atmosphere is limited to a maximum of 0.09C. I had a subscription to the Economist for many years, but dropped it because they jumped on the fake-science CAGW bandwagon. An error in the Economist article http://www.economist.com/news/science-and-technology/21613161-mystery-pause-global-warming-may-have-been-solved-answer-seems?fsrc=scn/tw_ec/davy_jones_s_heat_locker … See my comment http://judithcurry.com/2014/08/30/week-in-review-25/#comment-623285 … Deep ocean cannot become hotter than the surface! The deeper ocean is very cold and involves an enormous amount of mass. There is no way that the ocean depths could become hotter due to the sequestration of heat from added CO2 in the atmosphere! “No matter how warm the surface of the ocean gets, the ocean’s huge volume and deep basins keep temperatures at the bottom of the ocean at only slightly above freezing.”. OVER the past few years one of the biggest questions in climate science has been why, since the turn of the century, average surface-air temperatures on Earth have not risen, even though the concentration in the atmosphere of heat-trapping carbon dioxide has continued to go up. This “pause” in global warming has been seized on by those sceptical that humanity needs to act to curb greenhouse-gas emissions or even (in the case of some extreme sceptics) who think that man-made global warming itself is a fantasy. People with a grasp of the law of conservation of energy are, however, sceptical in their turn of these positions and doubt that the pause is such good news. They would rather understand where the missing heat has gone, and why—and thus whether the pause can be expected to continue. The most likely explanation is that it is hiding in the oceans, which store nine times as much of the sun’s heat as do the atmosphere and land combined. [Actually, the ocean stores 1000 times as much heat as the atmosphere, and the tail does not wag the dog] But until this week, descriptions of how the sea might do this have largely come from computer models. Now, thanks to a study published in Science by Chen Xianyao of the Ocean University of China, Qingdao, and Ka-Kit Tung of the University of Washington, Seattle, there are data [not according to Josh Willis of JPL who says there are no such "robust" data in the "real ocean" as opposed to the modeled ocean]. The two researchers draw this conclusion from observations collected by 3,000 floats launched by Argo, an international scientific collaboration. These measure the temperature and salinity of the top 2,000 metres of the world’s oceans. In general, their readings match the models’ predictions. But one of the specifics is weird. Most workers in the field have assumed the Pacific Ocean would be the biggest heat sink, since it is the largest body of water. A study published in Nature in 2013 by Yu Kosaka and Shang-Ping Xie of the Scripps Institution of Oceanography, in San Diego, argued that cooling in the eastern Pacific explained most of the difference between actual temperatures and models of the climate that predict continuous warming. Dr Chen’s and Dr Tung’s research, though, suggests it is the Atlantic (see middle chart) and the Southern Ocean that are doing the sequestering. 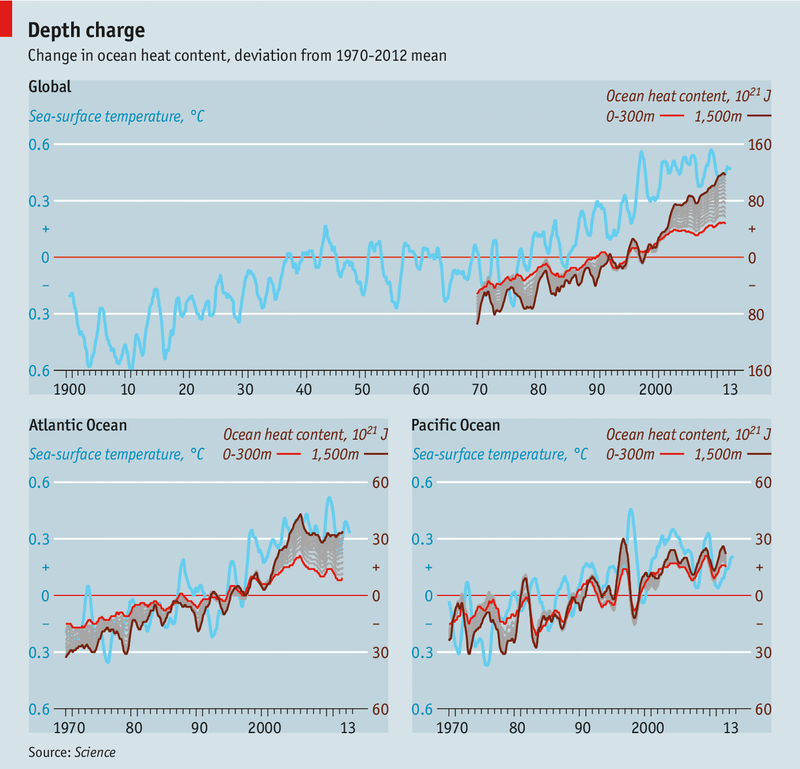 The Pacific (right-hand chart), and also the Indian Ocean, contribute nothing this way—for surface and deepwater temperatures in both have risen in parallel since 1999. This has an intriguing implication. Because the Pacific has previously been thought of as the world’s main heat sink, fluctuations affecting it are considered among the most important influences upon the climate. During episodes called El Niño, for example, warm water from its west sloshes eastward over the cooler surface layer there, warming the atmosphere. Kevin Trenberth of America’s National Centre for Atmospheric Research has suggested that a strong Niño could produce a jump in surface-air temperatures and herald the end of the pause. Earlier this summer, a strong Niño was indeed forecast, though the chances of this happening seem to have receded recently. But if Dr Chen and Dr Tung are right, then the fluctuations in the Atlantic may be more important. In this ocean, saltier tropical water tends to move towards the poles (surface water at the tropics is especially saline because of greater evaporation). As it travels it cools and sinks, carrying its heat into the depths—but not before melting polar ice, which makes the surface water less dense, fresh water being lighter than brine. This fresher water has the effect of slowing the poleward movement of tropical water, moderating heat sequestration. It is not clear precisely how this mechanism is changing so as to send heat farther into the depths. But changing it presumably is. Understanding that variation is the next task. The process of sequestration must reverse itself at some point, since otherwise the ocean depths would end up hotter than the surface—an unsustainable outcome. And when it does, global warming will resume. Correction: This article originally stated that 69 zettajoules of heat was 69 x 10^11 joules. In fact it is 69 x 10^21 joules. Sorry.